Great Canadian Offers a Variety of Siding Options for Installation or repair in Edmonton, Calgary, Red Deer and Saskatoon. Three Words That Mean The World to The Experts At Great Canadian Roofing. Roofing and Siding Installation and Repair. Great Canadian Roofing and Siding offers full service exterior installation and repair. With offices in Edmonton, Calgary, Red Deer and Saskatoon. Your Roofing and Siding Experts! Get your roofing done right from the start. With 24 Hour Emergency Roof Repair we are the only company you need to call. Cedar roofing offers an unmatched look and curb appeal to your home. Metal Roofing is a cost effective and extremely durable way to protect your home, business or warehouse from the harsh Canadian winters. Asphalt is the most common roofing product you see in Canada do to its low cost and ability to endure any summer or winter weather. Is it time for a new roof? Give us a call for a free estimate on re-roofing your home or business. We rip out, haul away and replace your roof with precision and quality. Building a new home? We offer only the best quality siding products with quick and affordable installation from our skilled & licensed team of experts. When an accident happens and you need your siding repaired we are your one stop shop for quality and service on siding repairs. Vinyl siding offers great durability and is the most common siding in Alberta and Saskatchewan. James Hardie Plank is a stronger and even more durable siding than vinyl siding. It is dent resistant and is easily installed to protect your home from the elements. CanExel® Siding is made with super compressed wood fibers making it extremely strong and durable for the harsh Alberta and Saskatchewan winters. This is the most elegant and durable siding that you can get for your home. Raising your curb appeal while protecting your home from all elements Canada has to offer. Great Canadian is proud to offer roofing in Calgary, Edmonton, Saskatoon and Red Deer with a 5-year workmanship guarantee on re-roofing jobs. Installing siding in Calgary can add value to your property while also playing a critical role in the overall energy efficiency of your home. Your windows and doors in your Alberta or Saskatchewan home home are more important than you may think. We’ll make sure that your home;s exterior drainage system is installed and maintained properly to keep rainwater and melting snow away from your home’s foundation. Through this process, we will identify places where your home or office is losing energy. 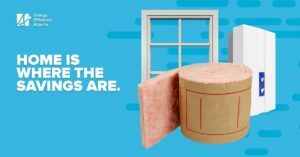 Adding extra Insulation to your attic is an easy and affordable way to make your home energy efficient. To keep your home or office building looking and functioning at its best, you need a roofing contractor in Alberta and Saskatchewan with experience in standing up to the harsh weather conditions found in our corner of the world. Great Canadian has been in business for more than 20 years. We’re one of the largest roofing companies in Calgary, Edmonton, Saskatoon and Red Deer and we know what materials to use to keep your roof, siding, doors, and windows secure against the winter snow and summer heat. Great Canadian is committed to making energy-efficient improvements more accessible and affordable for property owners in Alberta and Saskatchewan. We are happy to partner with Energy Efficiency Alberta, to bring you great discounts on improving your insulation and installing energy-efficient windows. Working with Great Canadian and Energy Efficiency Alberta, you can start saving at installation and continue the savings on your energy bills! Excellent job done by the whole crew at Great Canadian…happy to recommend them to anyone. Right from the beginning they were professional and easy to deal with…priced right and the workmanship was awesome… Thanks for your work! Great Canadian was great and did an excellent job. With the professional manner in which they displayed I would highly recommend them for any other jobs which you may require completed. I want to applaud the work of the men sent to install my window. Sean, Tim & Bob came to install my large bow window. I watched as they removed my old window and installed the new one. They worked efficiently, carefully and with great skill. These men are polite, friendly, and obviously care about doing a job well. I admired the skill which made this difficult job seem so easy. At Great Canadian Roofing we use state of the art tools in all our installation services and repair services. We have been proudly roofing in Edmonton, Calgary, Red Deer and Saskatoon for over 25 years. Top Quality roofing and siding services at competitive prices. Call for your free no obligation estimate. At Great Canadian Roofing we use only top quality roofing and siding supplies to ensure a long lasting finished product. Great Canadian was founded in 1997 and have been proudly servicing homes in Alberta and Saskatchewan in all roofing and siding services. At Great Canadian Roofing we offer 24 hour emergency services. Please call 1 877-766-3797 for immediate service.